At the recent Big Chocolate Show held in Manhattan, one chocolate stood out for me. Conexión’s 70% Pineapple & Pink Salt single origin bar. With such a festive orange and yellow wrapper from Ecuador, I expected joy and got it. A first bite had a tinge of saltiness which led to chewy tropical candied pineapple that made music in my mouth and mind. Now this was exactly what I could eat slowly while savoring each morsel. Slowly? Who was I kidding? Jeni's Splendid Ice Cream. Creamy, rich and wholly addictive. Imagine fragrant juicy blackberries flecked with lavender oil. This duo is enough to let willpower languish. And why should you? Give in to frozen joy! Très chère, I couldn't bring myself to tell anyone how much I was forking out for a pint. One bite was all I needed for this frozen addiction to take root which hasn't abated. 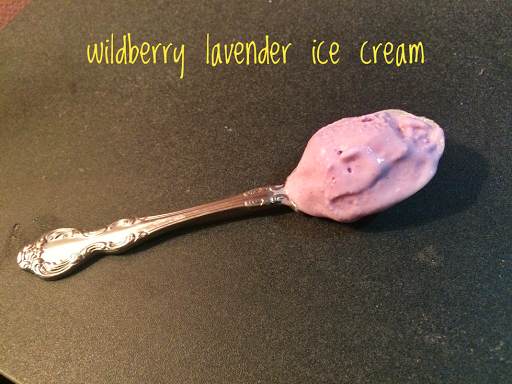 Hurrah for wildberry lavender ice cream! C'est magnifique. Do you dream about ribs? I do! The ribs I favor above all are the tamarind ribs at Indian Accent. Here two ribs appear to mesmerize the diner. Tangy, meaty, fork-tender. Eat these with your fingers. Close your eyes and savor each bite. Sheer nirvana! Cherries herald summer and I hope you have been eating them as much as I have these past two months. Think of all the wonderful ways to add cherries to heighten taste sensations - Crisp pork chops with brandied cherry sauce, Cherry clafouti, Cherry compote on house made vanilla ice cream, Cherries sandwiched into a crepe dusted with crushed pistachios, Added to a rumpot to savor in the autumn months. Nibbling on them throughout the day, but especially when lying on a chaise longue near a bay window! Artisanal chocolates seem to be the rage nowadays with so many bars from around the world. Now there is this bar from Hungary. Almost like eating Turkish Delight. Fabric Csokoládé, is definitely for those who prefer chocolates sickly sweet. Take a bite of this dark chocolate with Hungarian plum palinka and jam. Eat this slowly musing on the apricot, cherry and plum notes that will seep in sharply and then, if you have courage, and only then - have another bite. The Mexican Skeleton and I look forward eagerly to the Fancy Food Show in New York City. We take our time to see all the new edible products and make sure we sample as much as our stomachs can take in. Each year a new product captures our fancy. This year, we both fell in love with Dang Onion Chips. Crisp yet tender, oozing with caramelized onion confit flavor, our taste buds burst into song! We went back several times to get more of the samples given out. The very next day we went to Wholefoods and each bought two flavors: Salt & Pepper and Applewood BBQ. These chips are so mouthwatering that it is easy to munch one's way through a packet but we both like to enjoy them leisurely and so we ate ours with a glass of rosé. Then we hid the packets as we both knew that they would somehow mysteriously vanish in the middle of the night. Now that won't do, would it? The croissants in New York City have become stylish. Set aside the usual flavors of plain, cheese, ham & cheese or pain au chocolat. Elevate your taste buds to enchanting flavors like the crème brûlée croissant at the newly opened Union Fare. This croissant has a sheen on the exterior. Bite into it and a caramalized crunch with deep honeyed tones will assault your senses. A rich custard filling will then seep in. If it dribbles down your chin, let it. Scoop it up later and lick your fingers. Is this breakfast or dessert? Buy one and then another as even cold, it will continue to enchant. Peckish? Then join me on my travels with the Mexican Skeleton on our pursuit of food that sings.